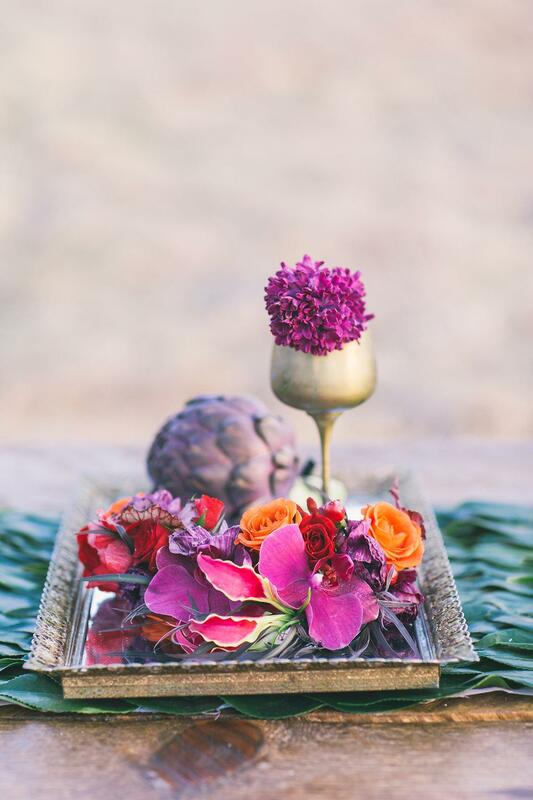 One thing that I’m sure of, is that when an amazing team of vendors come together for a day of inspiration, it’s a celestial dream come true! 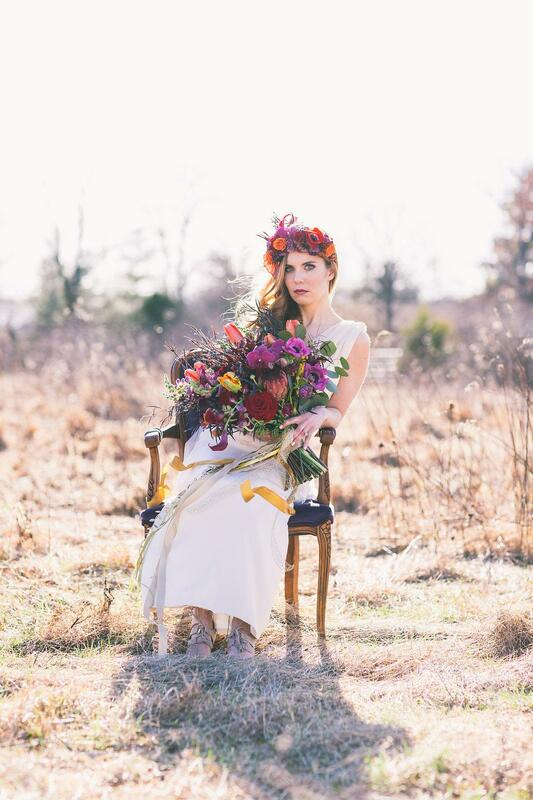 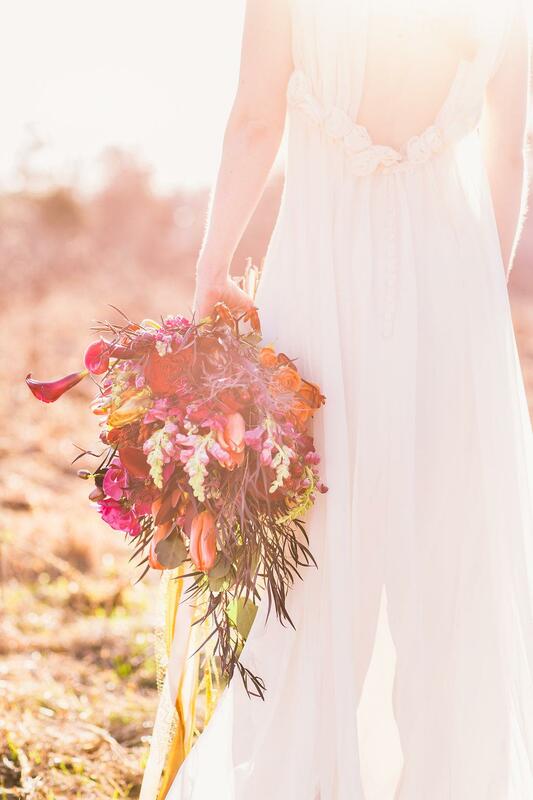 Arielle Fera Events + Maggpie Vintage Rentals + Julie D’ Agostino Designs and (many more) , joined forces to craft an ethereal shoot that is truly what dreams are made of! 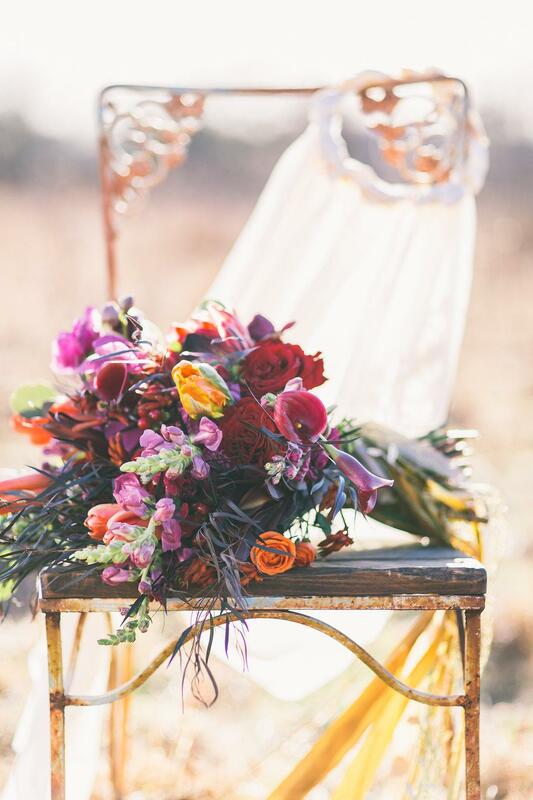 The bold, rich, and striking colors will be the first thing to catch your eye, but the gold and elegant details of this shoot will keep you enamored and wanting more! 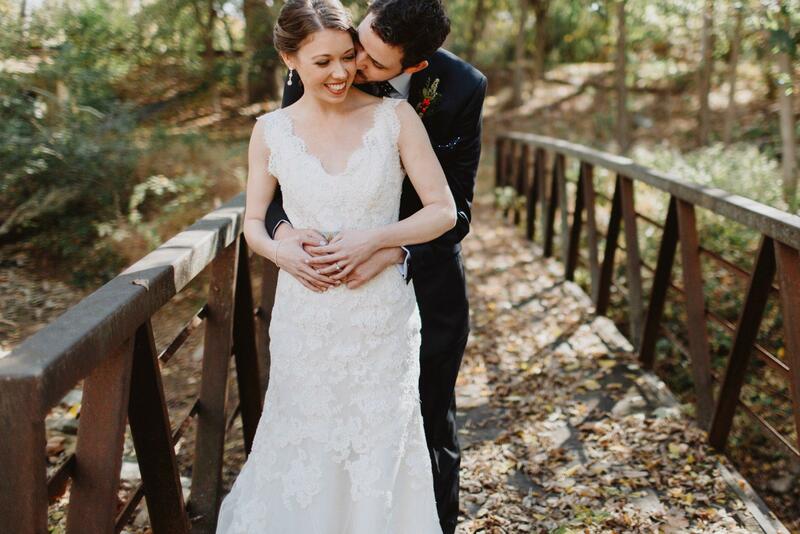 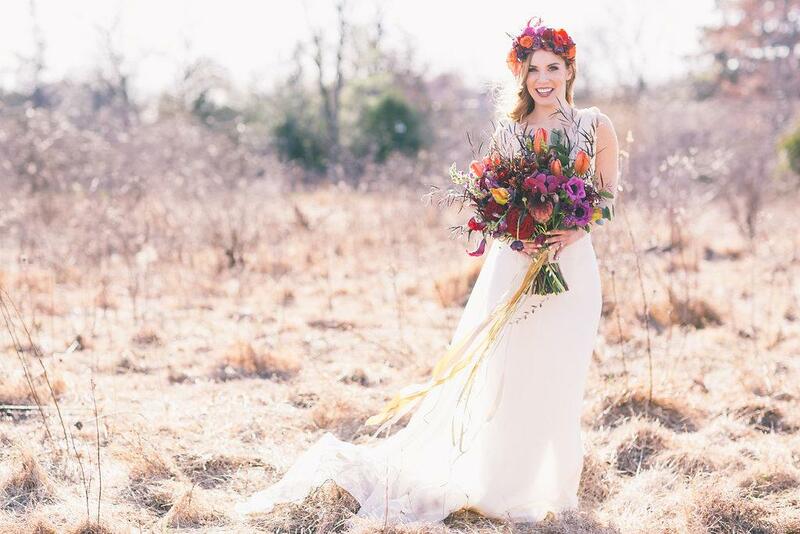 Photographer, Justin Johnson Photography captured every element of this shoot perfectly, and you will be left in awe and swooning for the rest of the week after see it all for yourself! 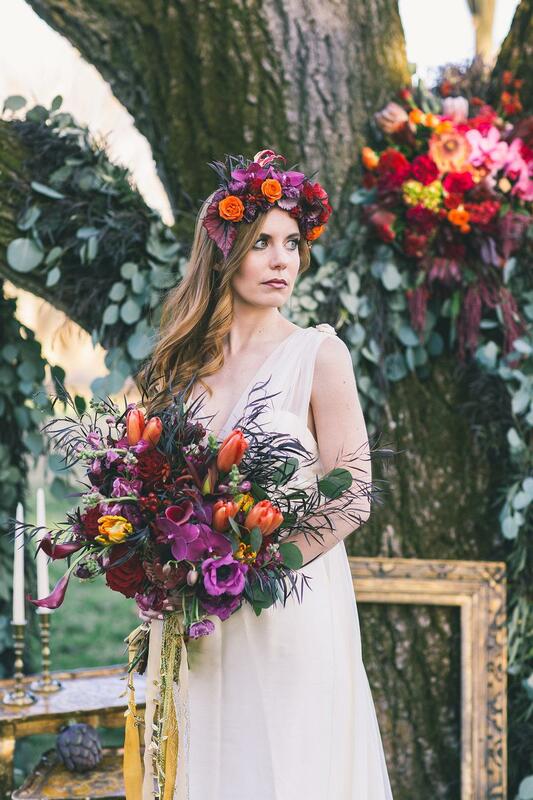 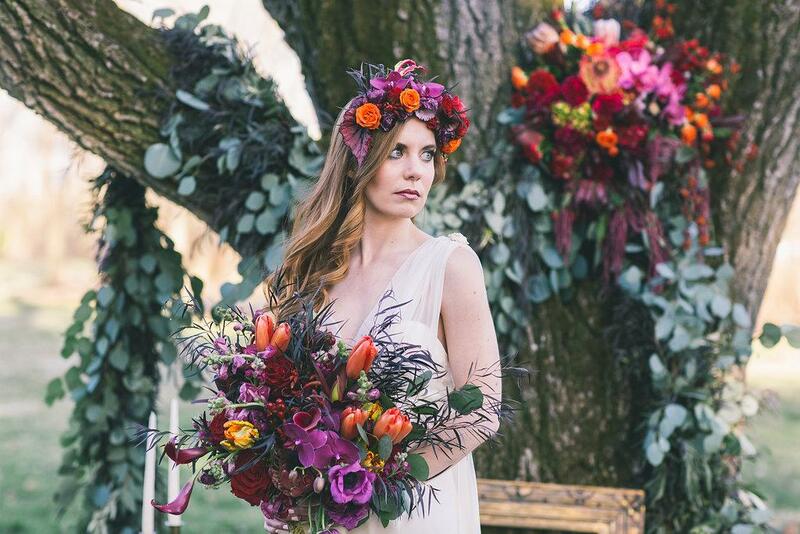 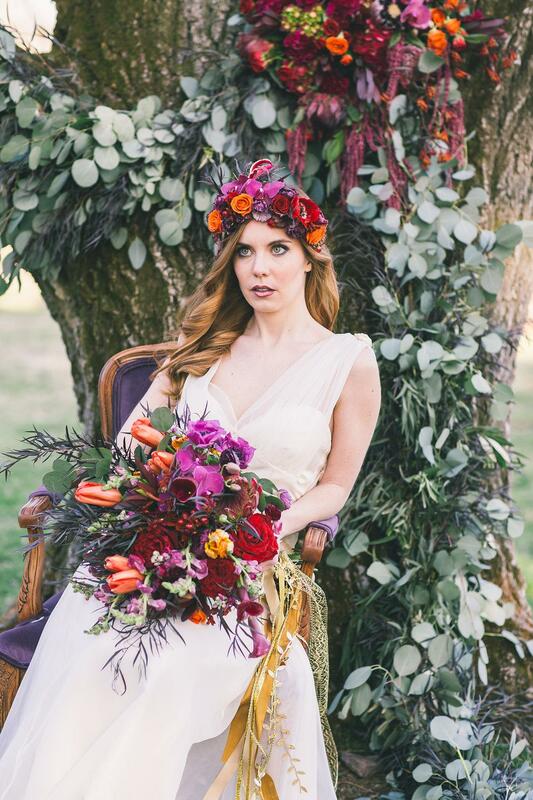 I am absolutely in love with the lush blooms, and the natural ambiance of this ethereal shoot, so if you’re a fan of floral crowns and woodland settings, then you’re going to get lost in this dreamy inspiration shoot! 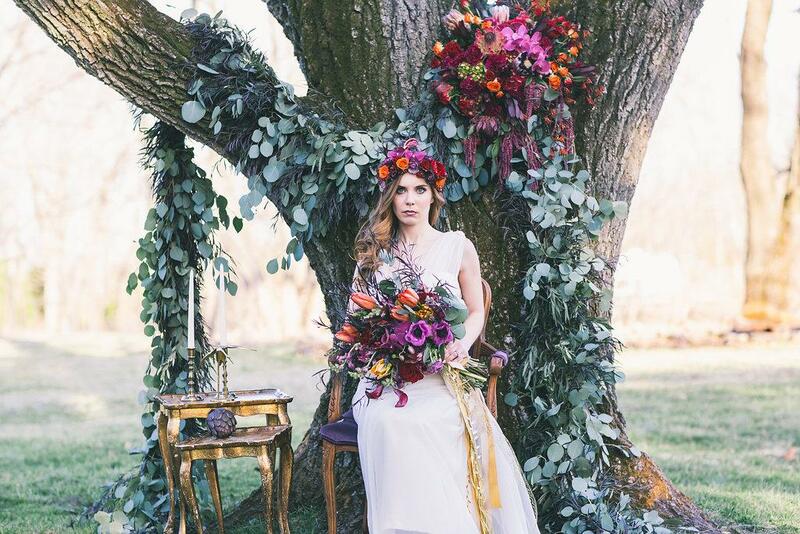 From Arielle Fera Events: We designed this shoot to inspire brides to use bold and dramatic colors to create an ethereal vibe for their wedding. 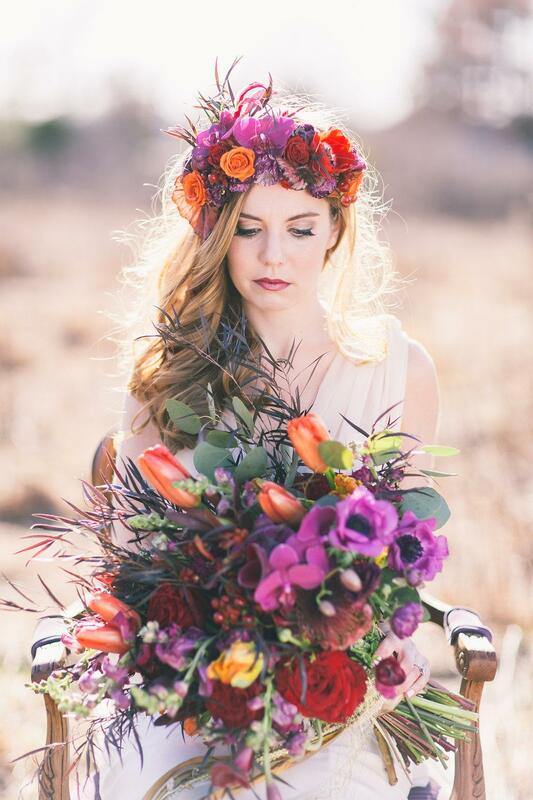 Showing that ethereal can be expressed beautifully in color. 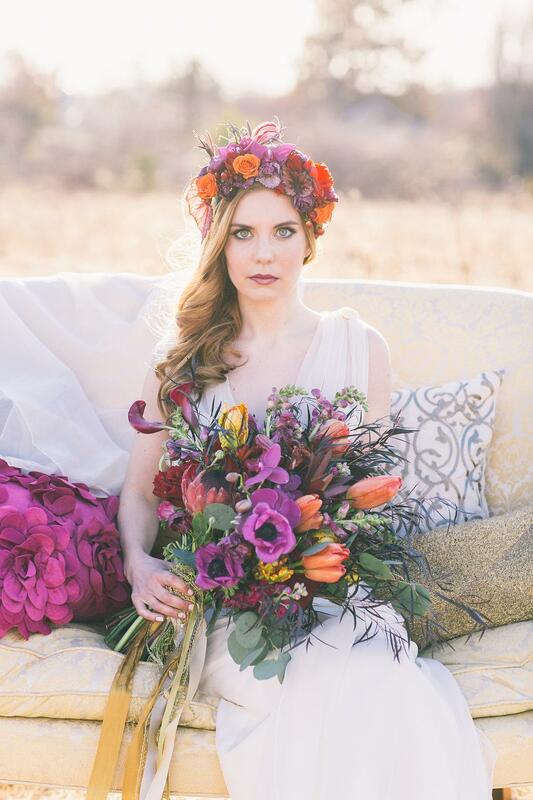 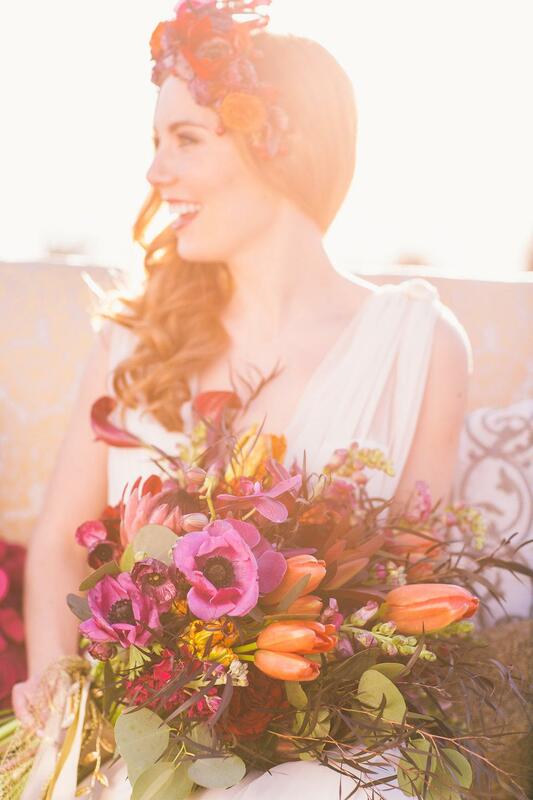 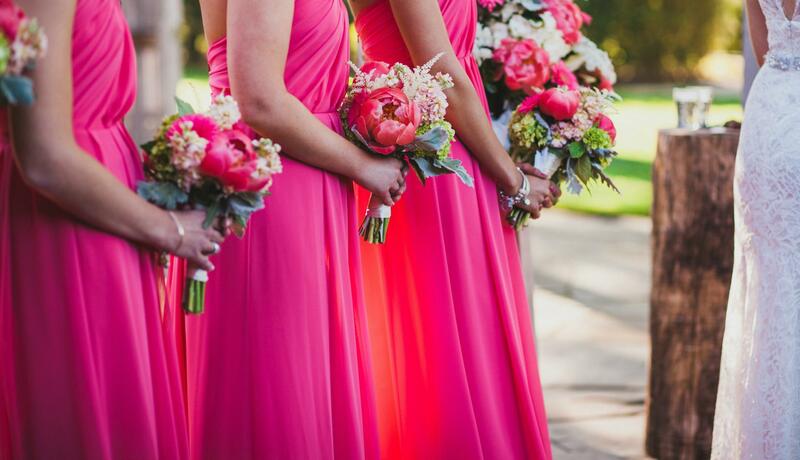 For our color palette we chose jewel tones in shades of fuchsia, ruby, orange, plum and vintage gold. 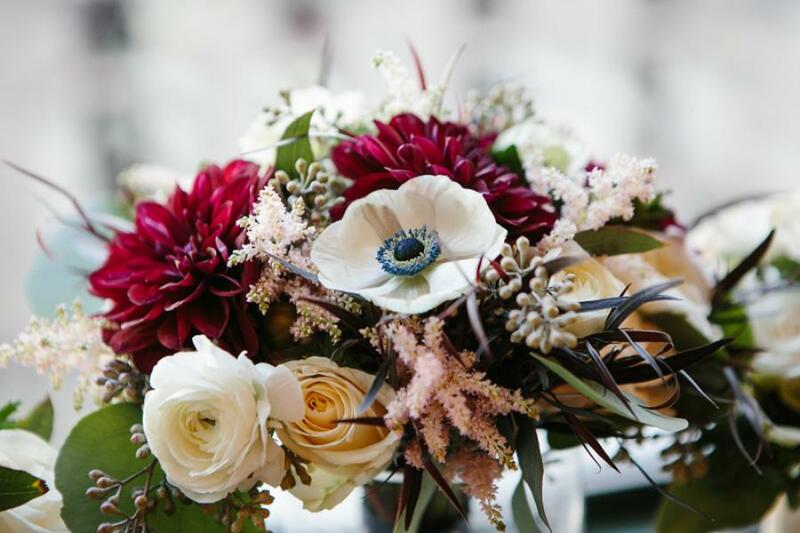 Let’s begin with the show stopping flowers that were designed by Julie D’Agostino Designs. 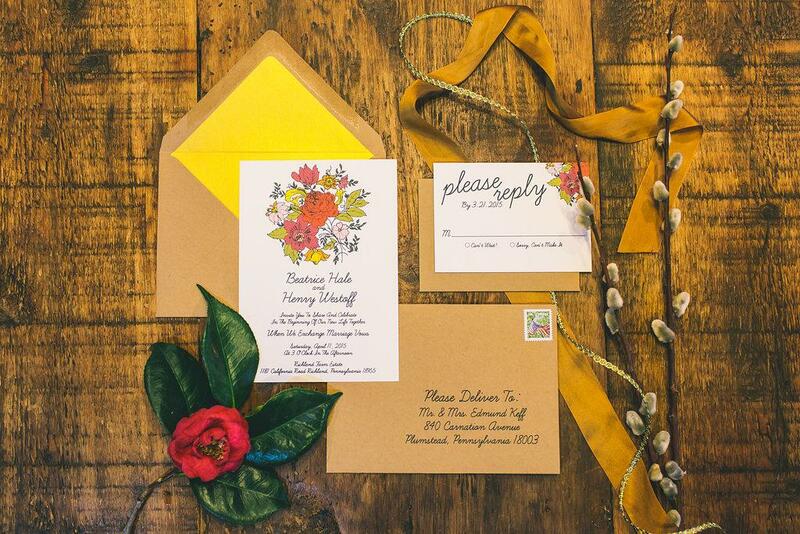 The overall floral style is loose, organic, and very lush. 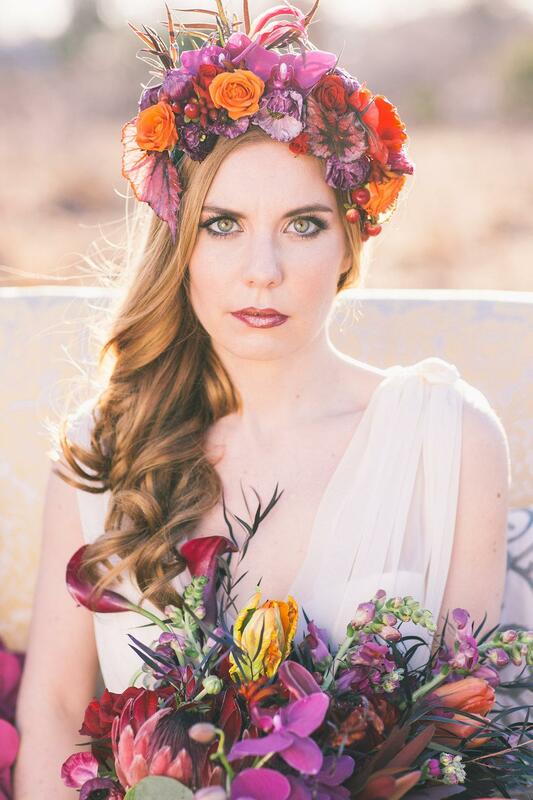 Perfect for the bride who loves an artistic free form look. 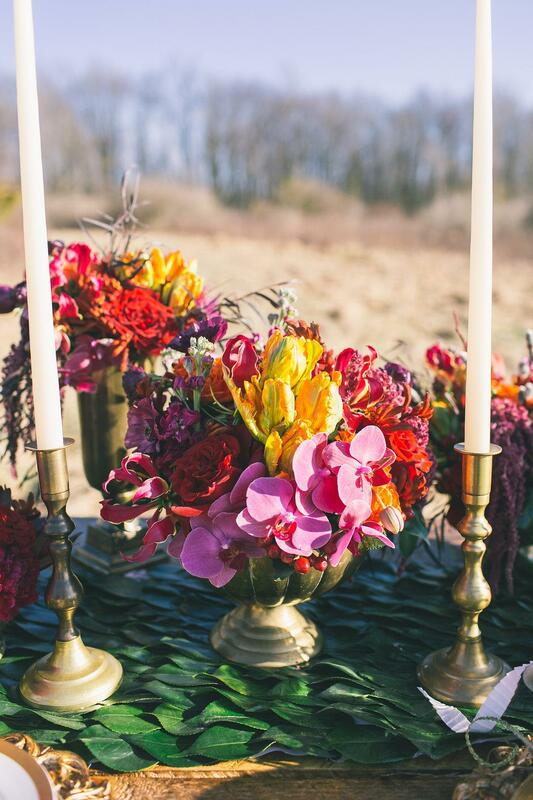 All of the flowers were sourced locally in the Philadelphia area. 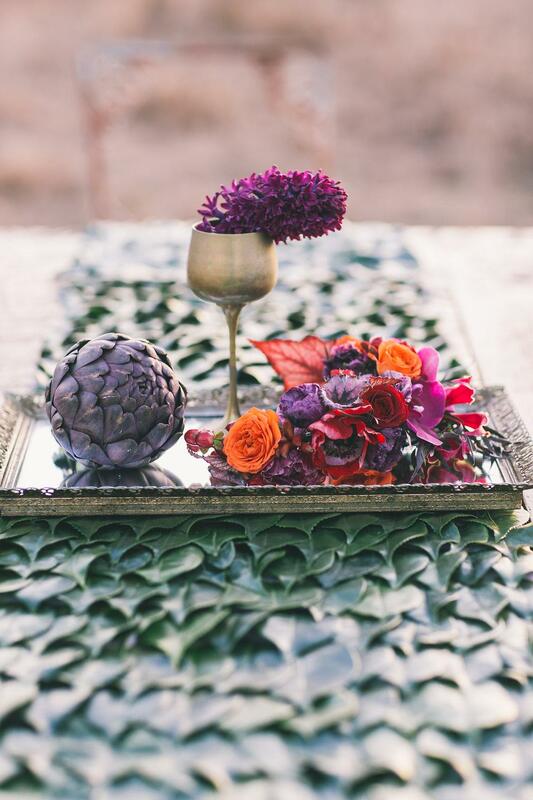 For the ceremony space, we created an organic, ethereal focal point. 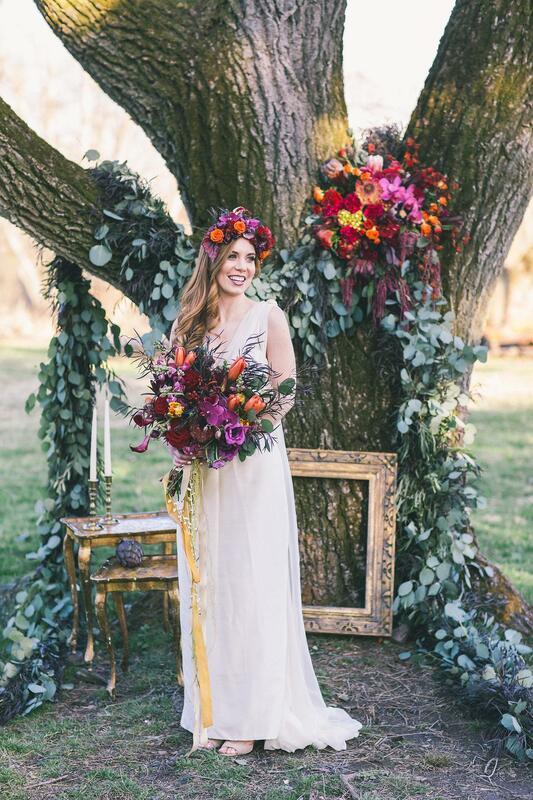 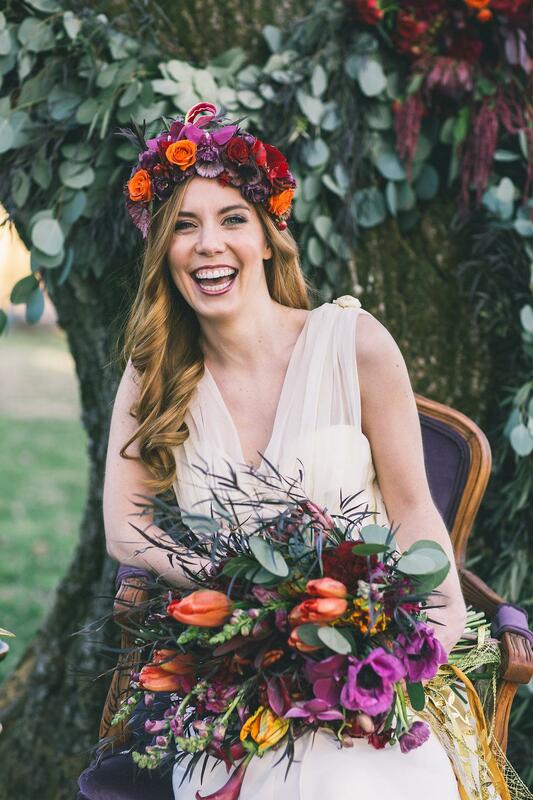 Julie hand constructed the whimsical floral garland out of agonis, olive, silver dollar and eucalyptus, with a lush hanging display of jewel toned flowers nestled in the boughs of a hundred year old oak tree. 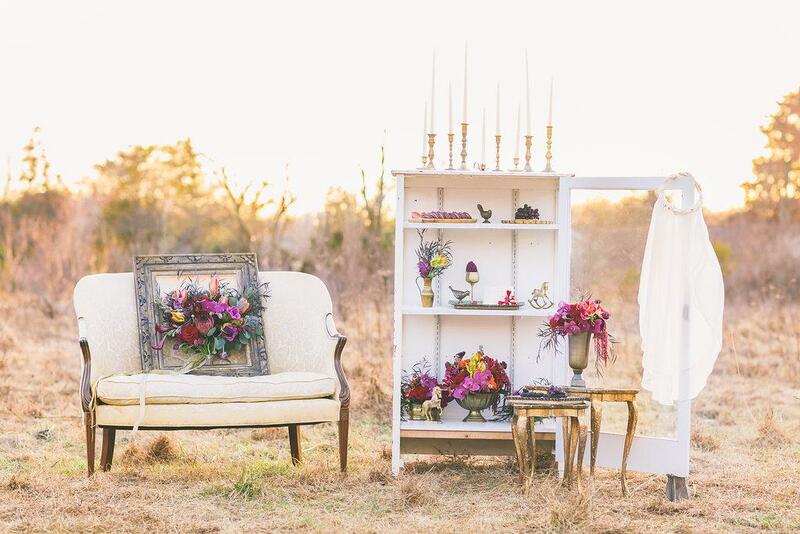 The gold nesting tables from Maggpie Vintage Rentals complemented and lent another visual element to the scene. 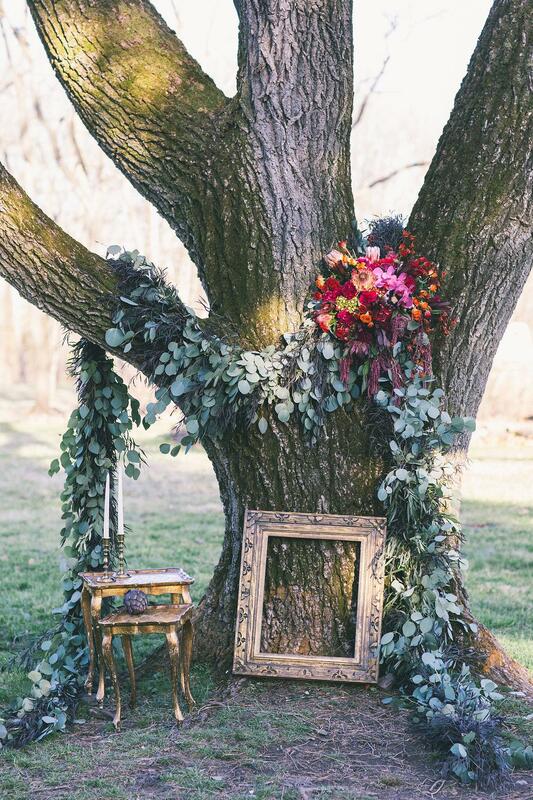 It is the perfect ceremony backdrop for any ethereal bride to say “I do”. 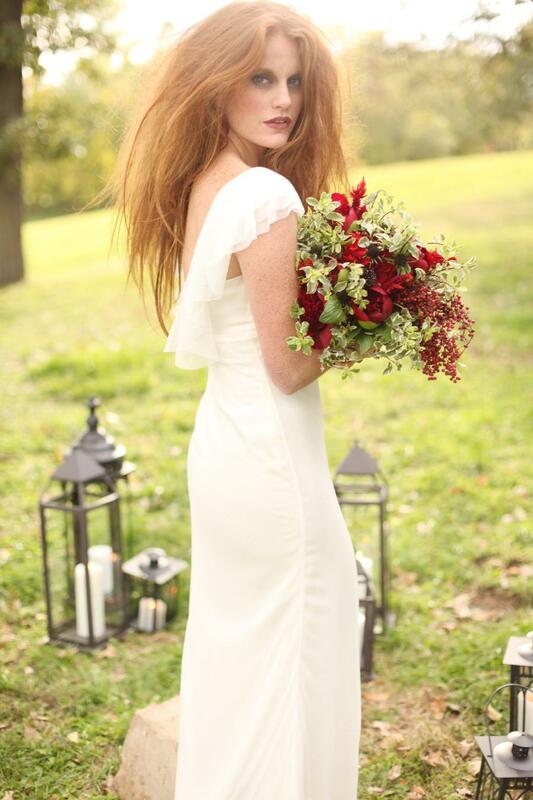 Our bride carried a loose and very lush bouquet filled with long stems of trailing flowers and foliage. 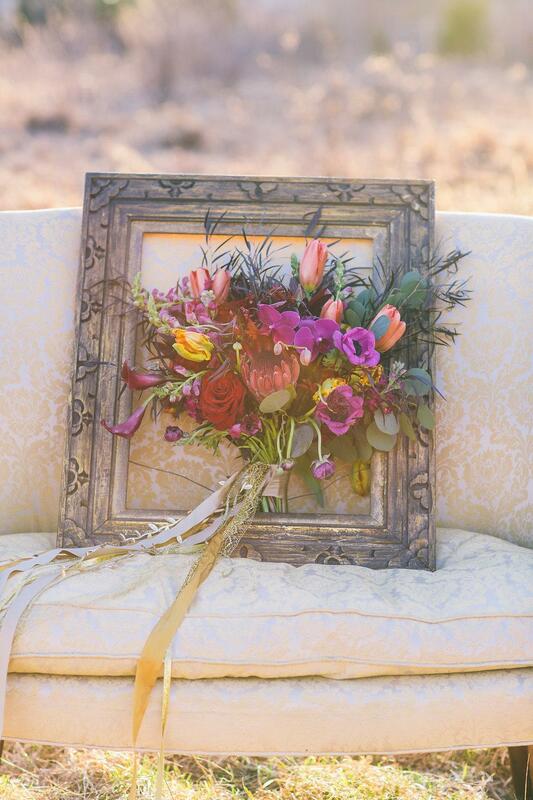 The stunning bouquet was hand tied with ribbons in various gold tones and textures. 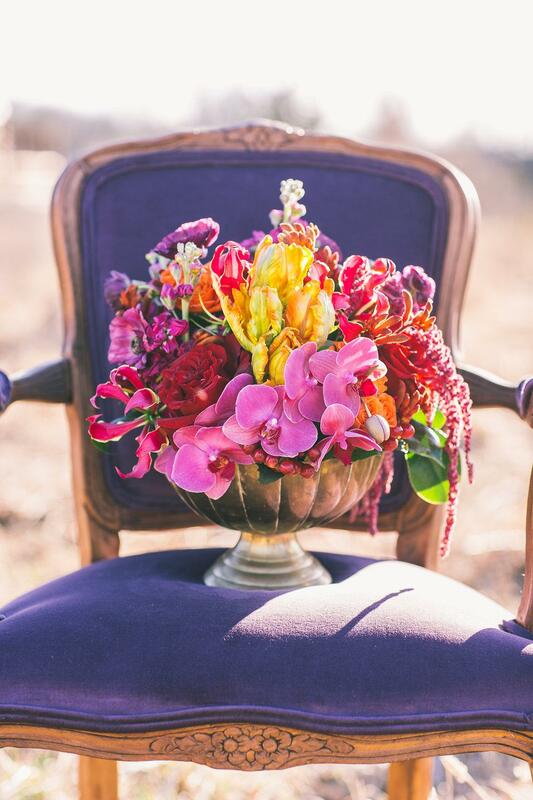 When the bouquet left her hands it was gracefully styled on the vintage velvet chair and the gold damask settee which is part of the collection at Maggpie Vintage Rentals. 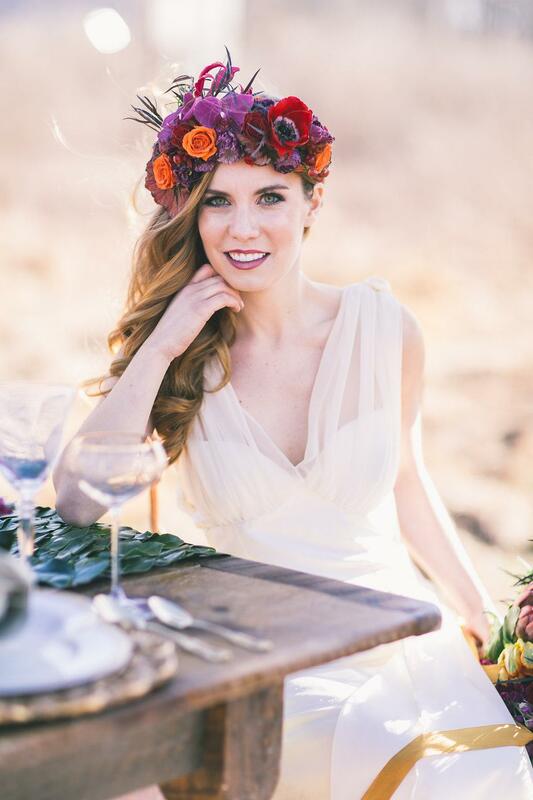 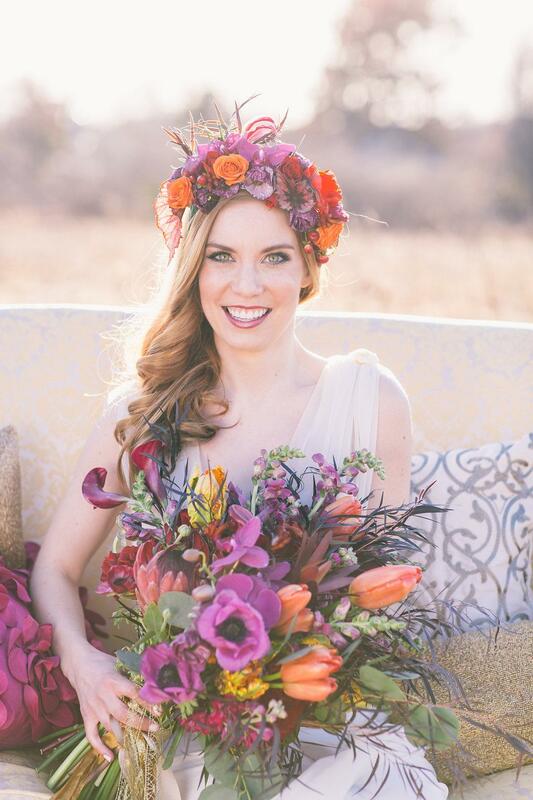 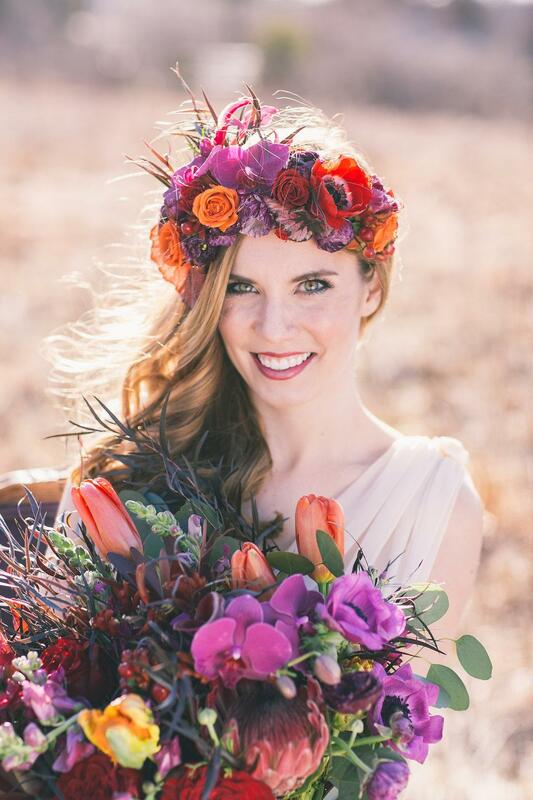 A hot bridal trend right now is the flower crown as seen on our bride. 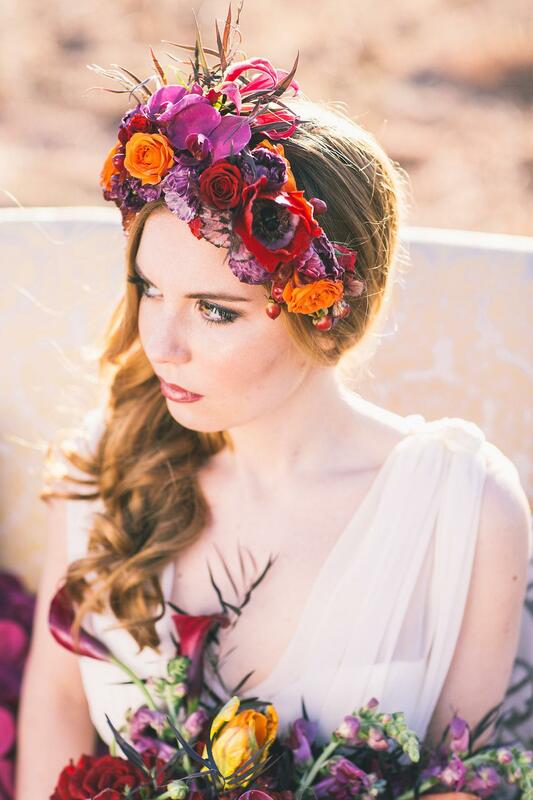 This gorgeous statement piece is ideal for any bride looking for an alternative to a veil. 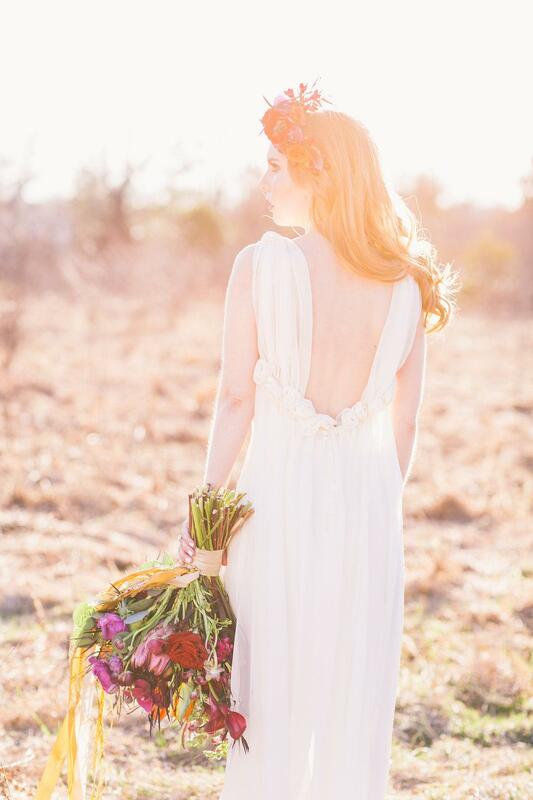 Speaking of the bride’s attire, let’s talk about that vintage silk crepe chiffon dress! 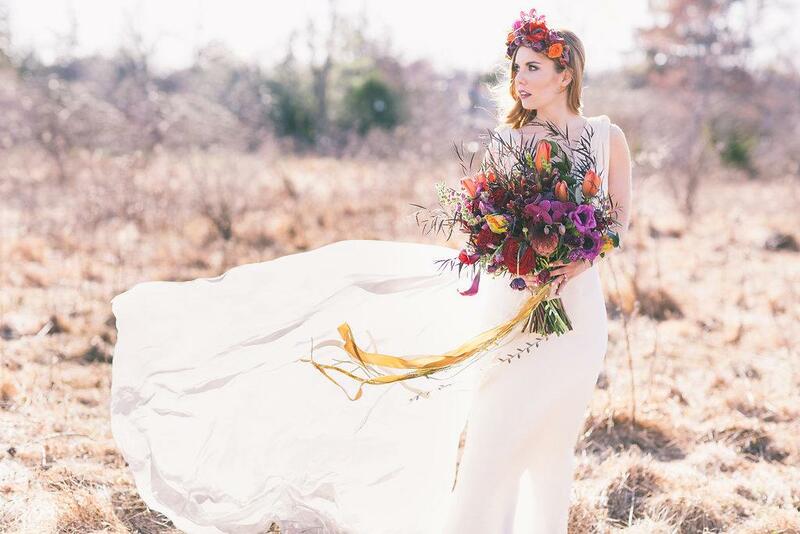 This ethereal gown was once worn by her aunt. 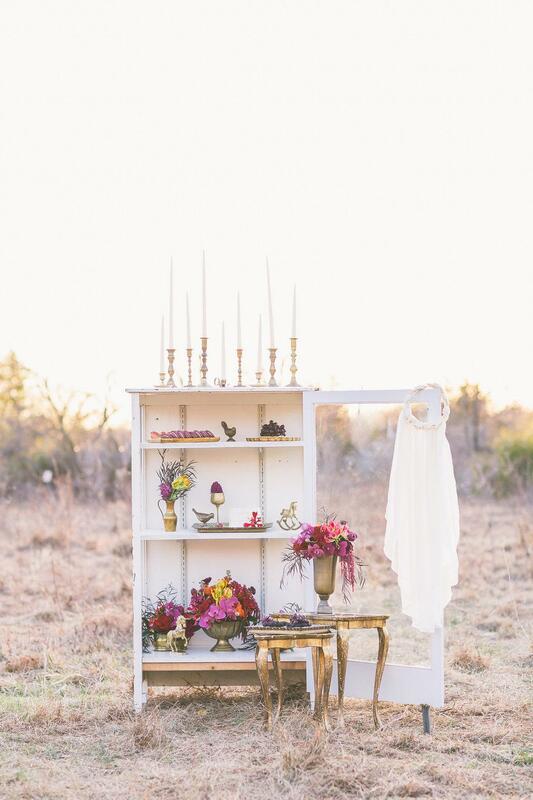 This is a great idea for any bride looking for a special way to honor a family member in her wedding, plus, it can also serve as her “something borrowed”. 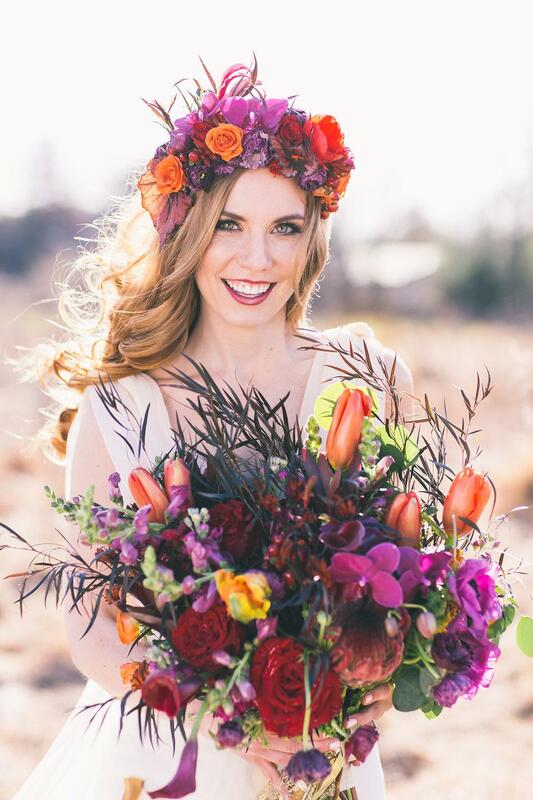 Our bride’s look was made complete with the striking makeup artistry done by Marissa Tice of Daneene Jensen & Associates, Hair and Makeup Artists. 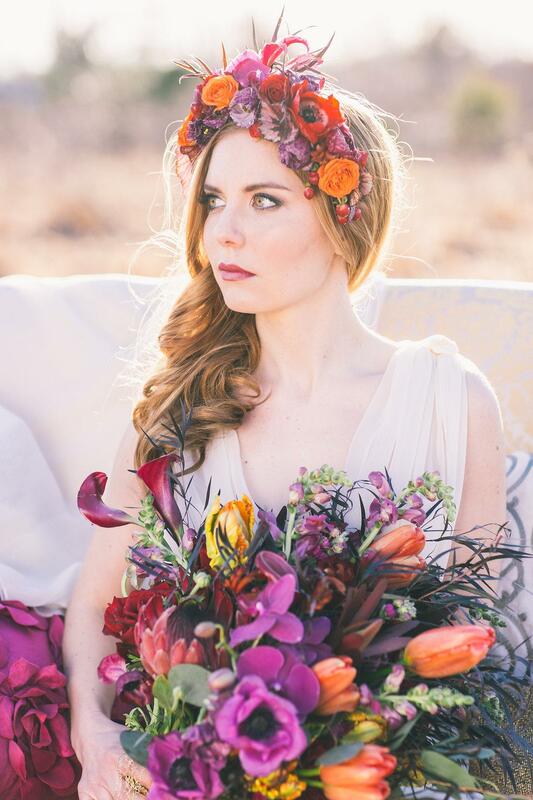 That jewel lip is so sultry!! 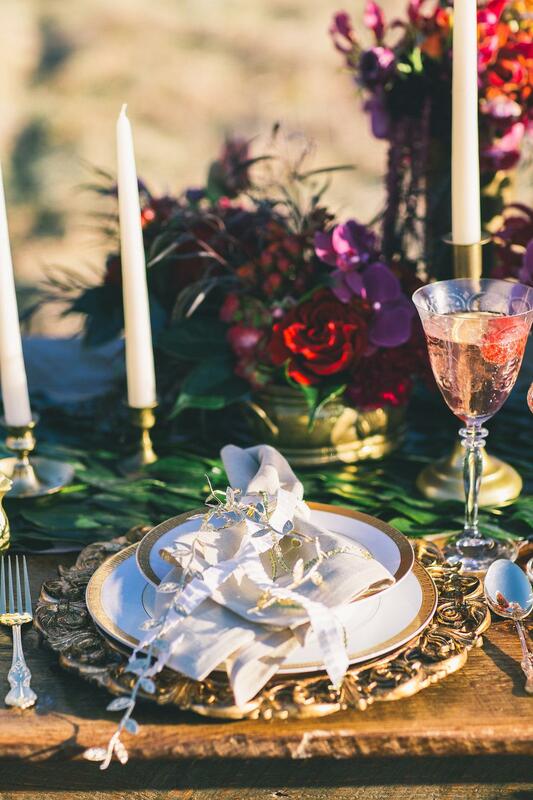 The sweetheart table is such an important element in any wedding celebration, after all it is where the bride and groom share their first meal together as husband and wife. 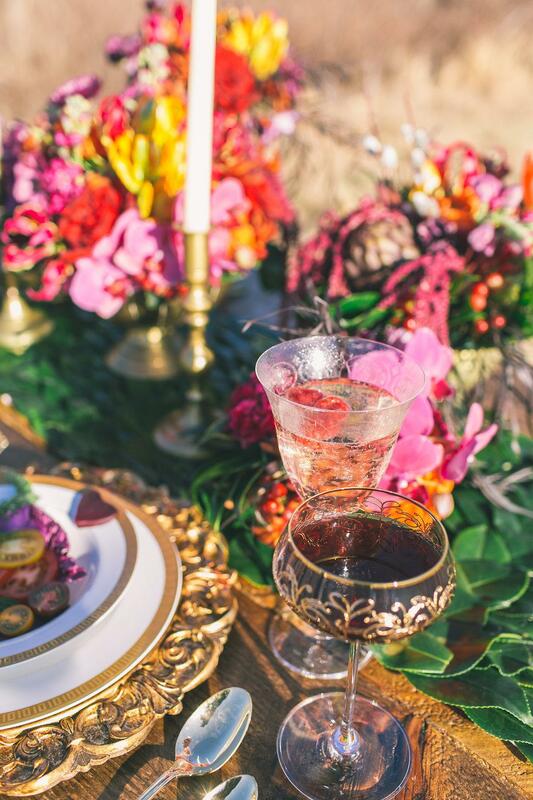 This momentous moment deserves a table dressed to the nines! 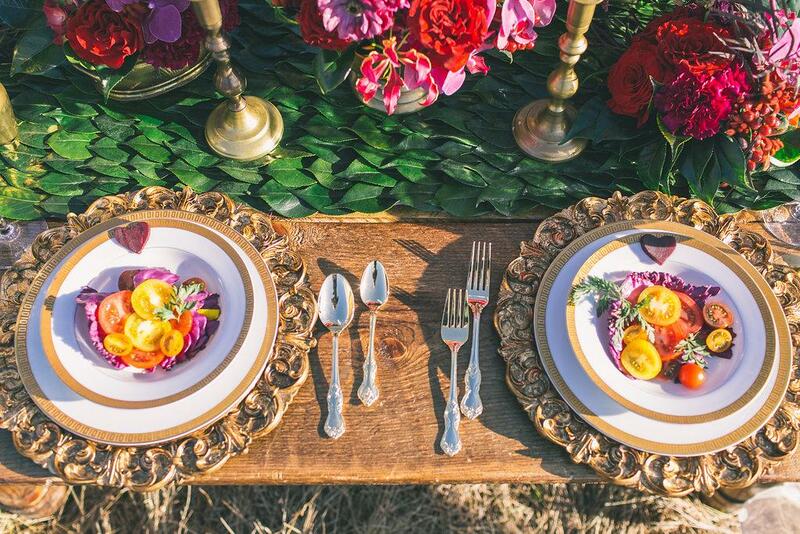 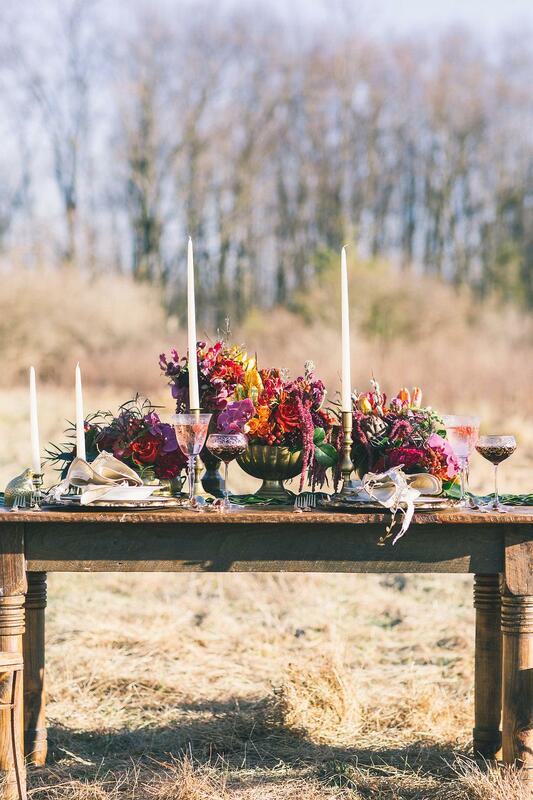 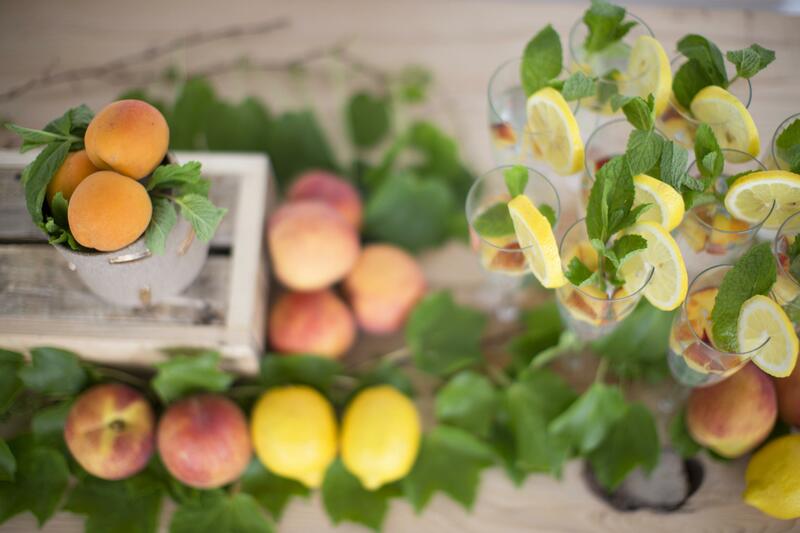 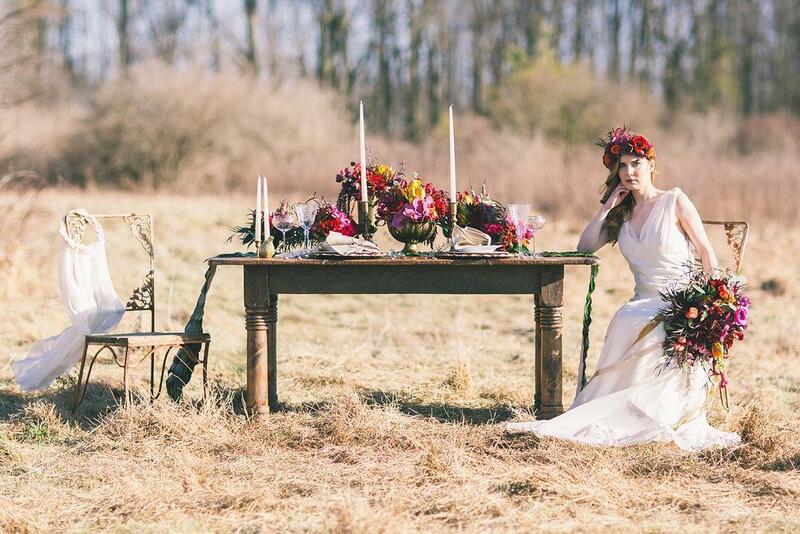 For this shoot, we chose to feature a hand-built wood table and wrought iron rose chairs by Maggpie Vintage Rentals. 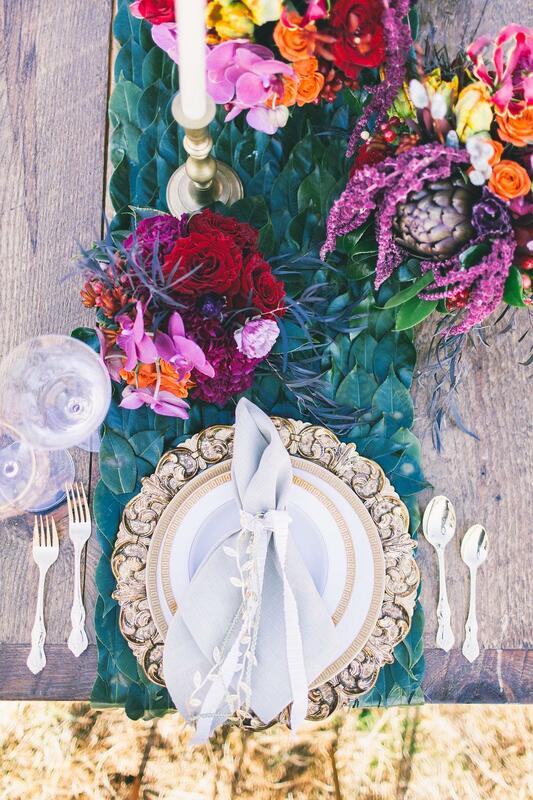 The camellia leaf table runner was handmade and added so much texture and earthiness to the tablescape design. 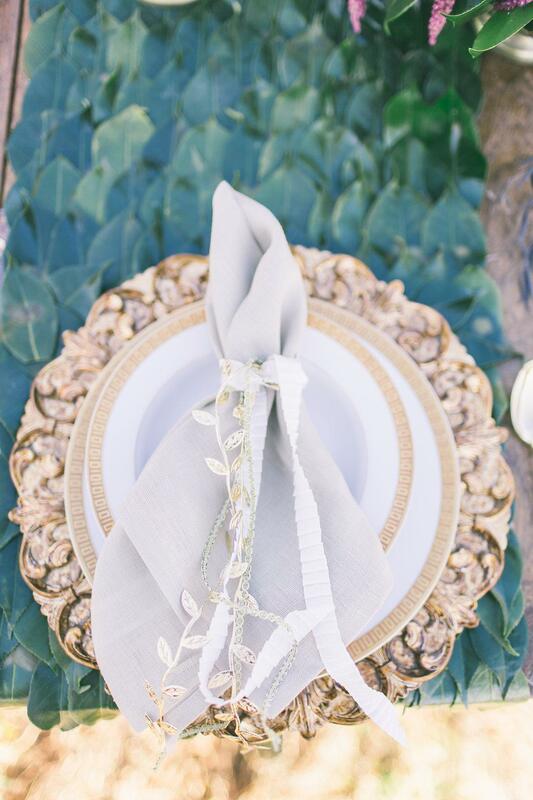 The table was set with a collection of heirloom gold place settings and linen napkins loosely tied with ribbons. 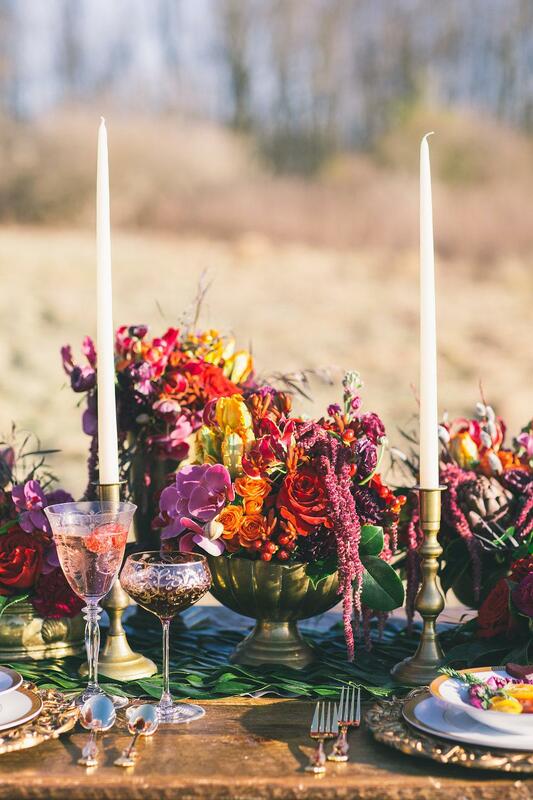 Vintage brass candlesticks and whimsical animal figurines create a stunning visual display set among the collection of urns and compote dishes that were filled to the brim with vibrant blooms. 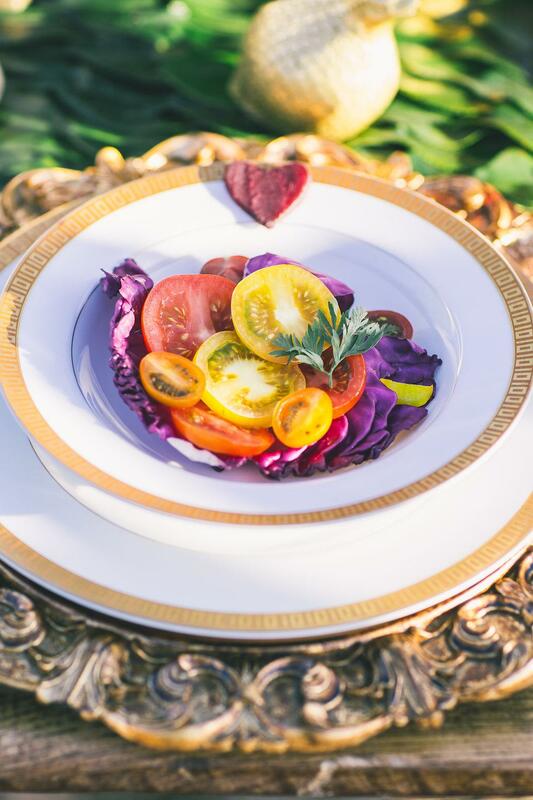 A local summer tomato salad was served to continue the rich color palette. 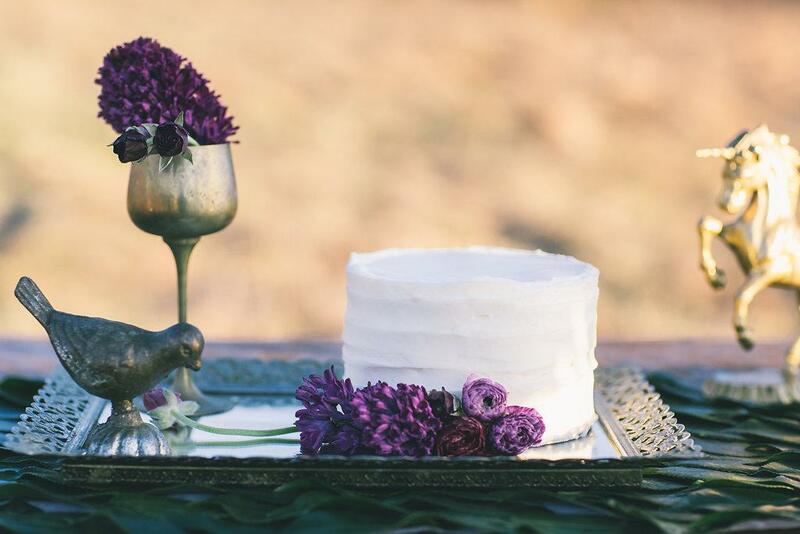 And of course no celebration is complete without dessert! 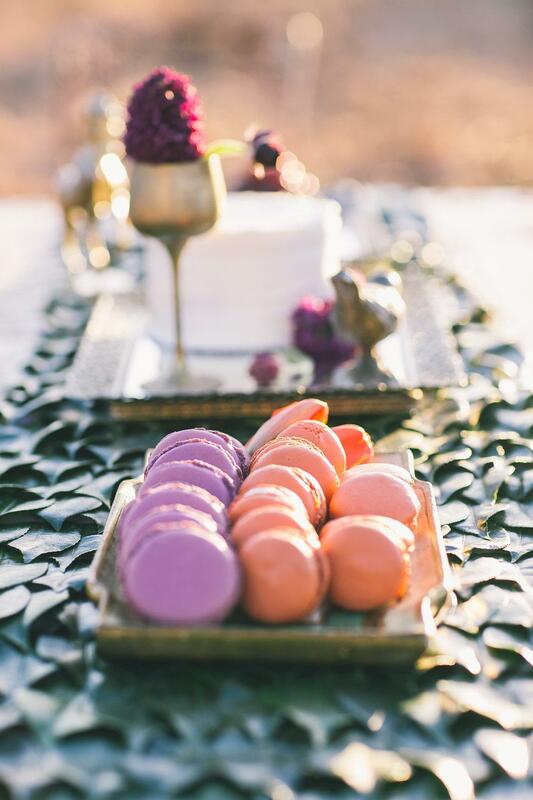 Sweet Ruminations Custom Cakes & Dessert Shop made delicious macaroons in luscious shades of orange and plum, fruit tarts topped with blackberries and grapes and an ethereal sweetheart cake. 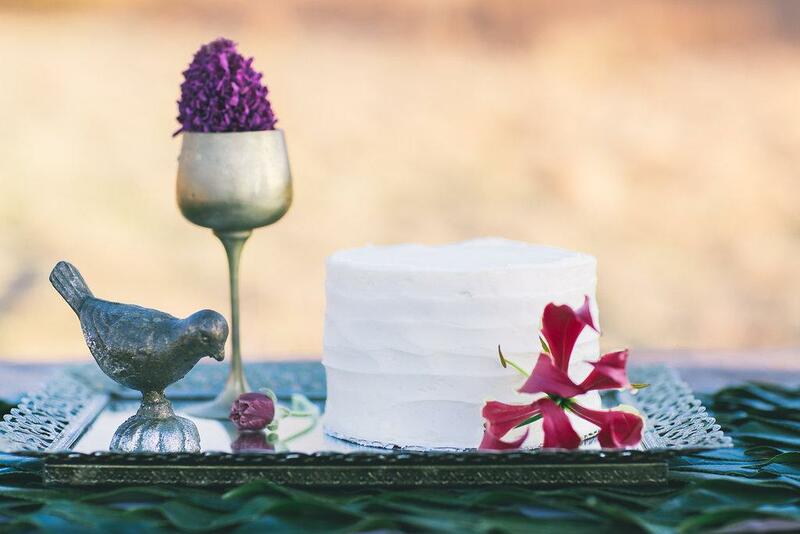 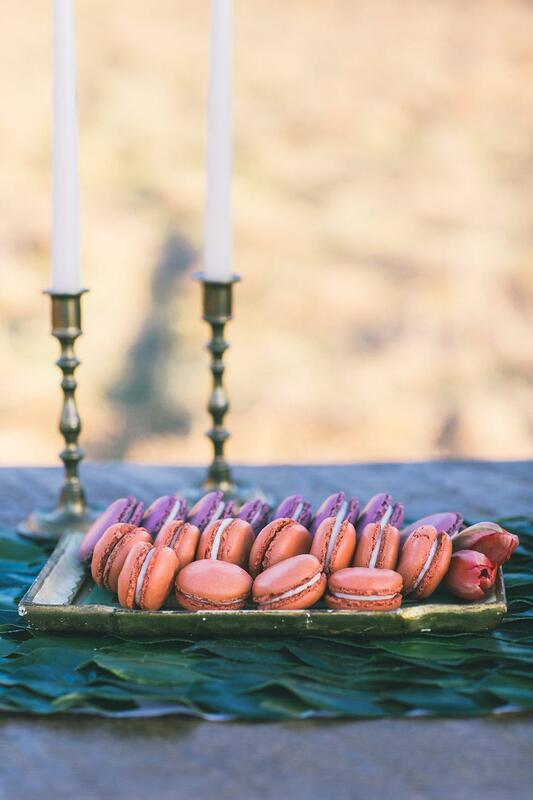 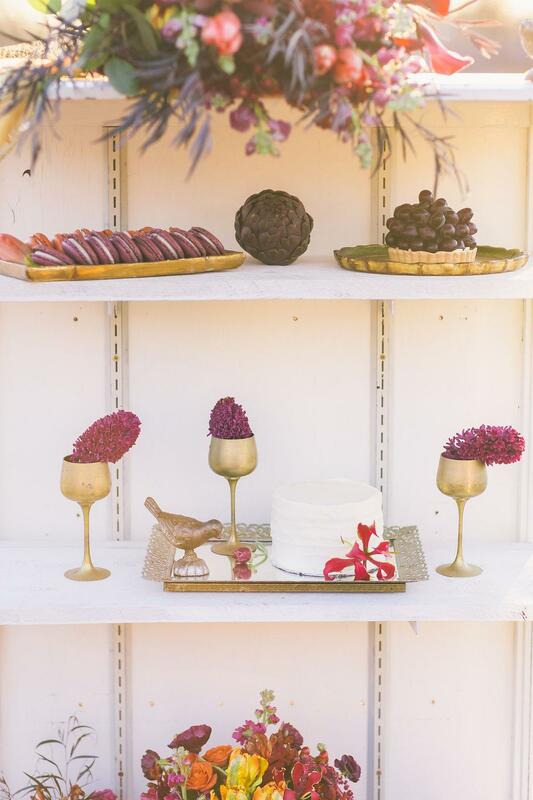 Desserts are a great way for brides to extend their color palette into every last detail of their wedding. 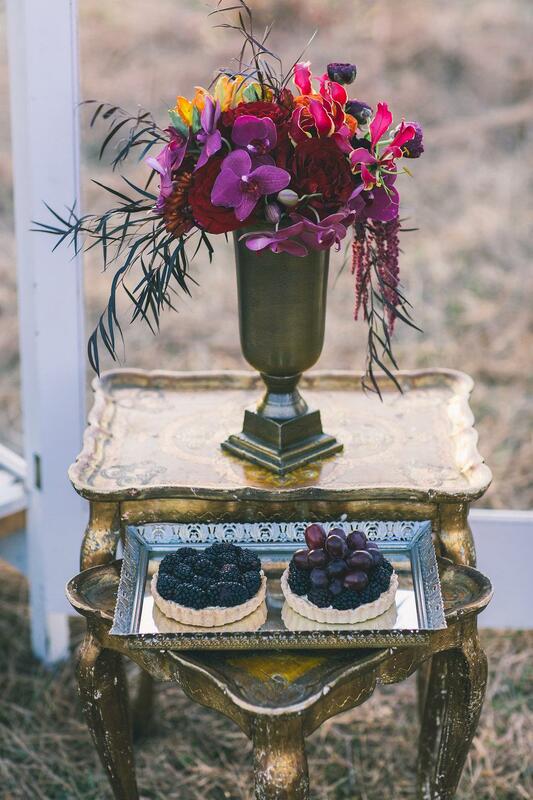 The desserts were perfectly styled in a rustic cabinet, which is a clever new alternative to the traditional. 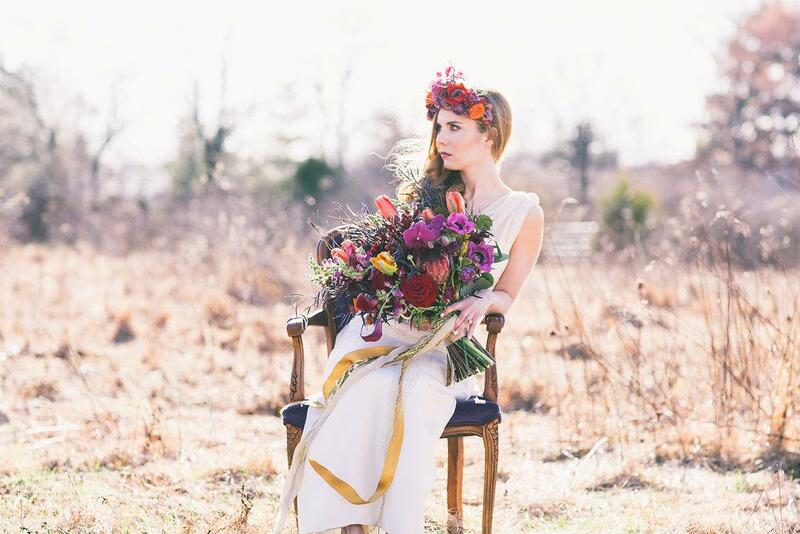 The shoot was held at a private estate right outside of Philadelphia. 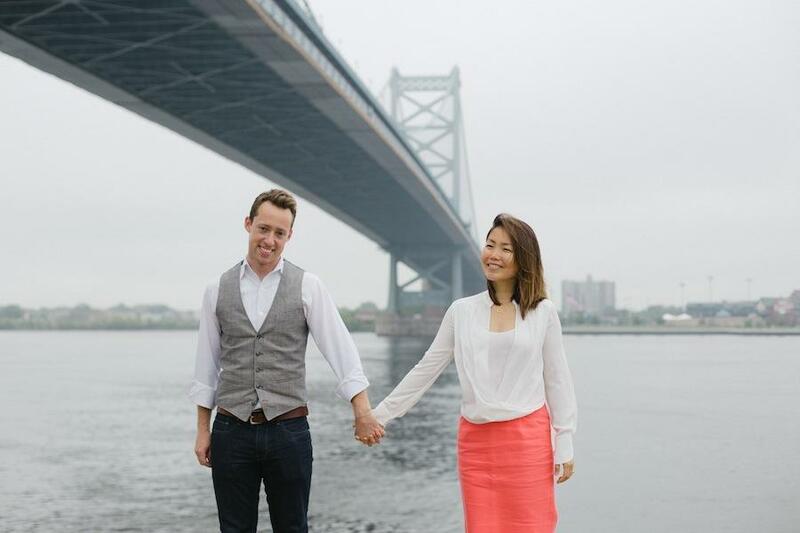 Being a short drive away from large stately residences with acres of land is one of the things that makes Philadelphia so appealing. 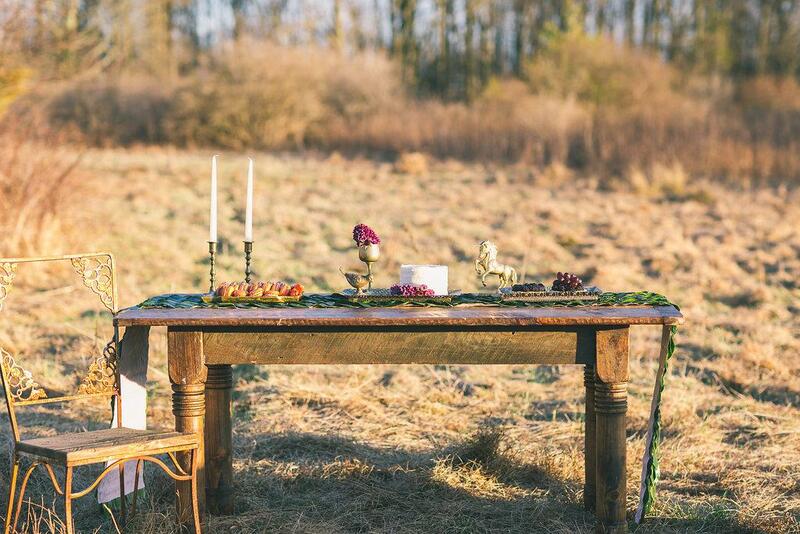 One minute you can be in the city, the next in the middle of a beautiful rolling field. 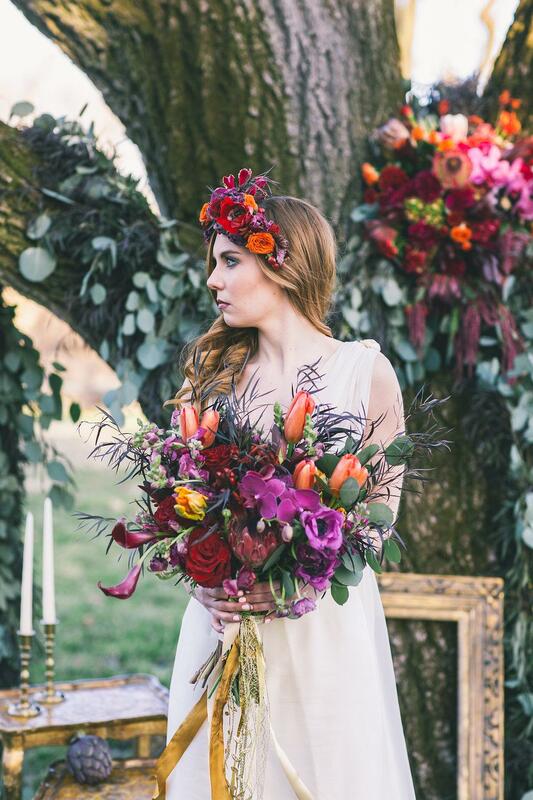 All the vendors who participated in this shoot are proud to call Philadelphia home! 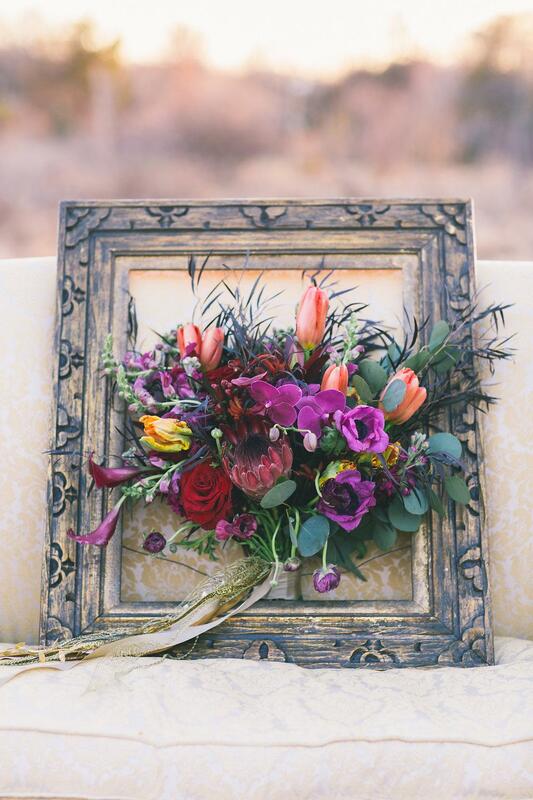 We serve the city and the surrounding communities with our artistic talents! 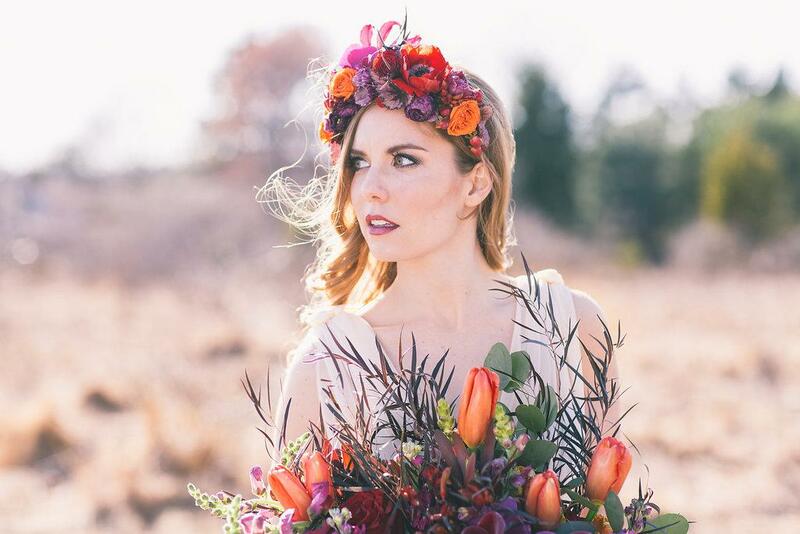 We hope this shoot will inspire Philadelphia brides who are looking to express their love in a bold and angelic way.